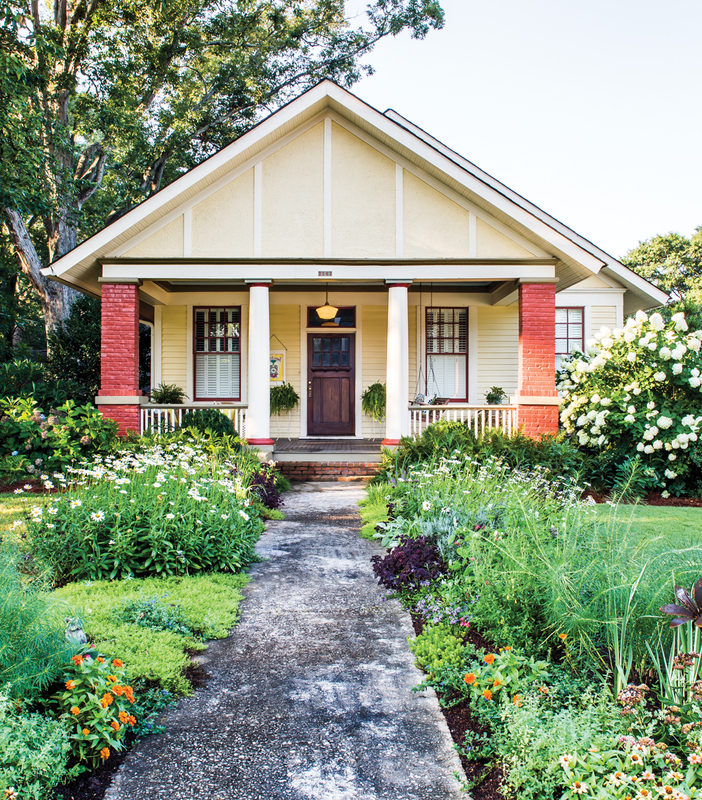 Stephanie Nase spent her first decade in this Craftsman bungalow creating a lush garden. “I desperately wanted a cut-flower garden and flowering shrubs,” she says. “I wanted to include plants indigenous to this area and what might have been in a garden in the early 1900s.” Azaleas, hydrangeas, and camellias now grow alongside boxwoods for year-round greenery. She is able to pick daisies, daffodils, snap dragons, dahlias, and peonies, among many other flowers. In 2006, Stephanie Nase began her search for a charming bungalow in Virginia-Highland before moving on to Inman Park and Candler Park. But she wasn’t having much luck in those well-known intown neighborhoods. “One day, I happened to drive across DeKalb Avenue from Candler Park into Kirkwood,” she says. “I had never heard of Kirkwood and was surprised to find this gem of a neighborhood.” The very next day, she snagged an early 1900s Craftsman bungalow. Among its architectural charms: vintage hardwood floors, built-in cabinets and wainscoting, high ceilings, and window seats. 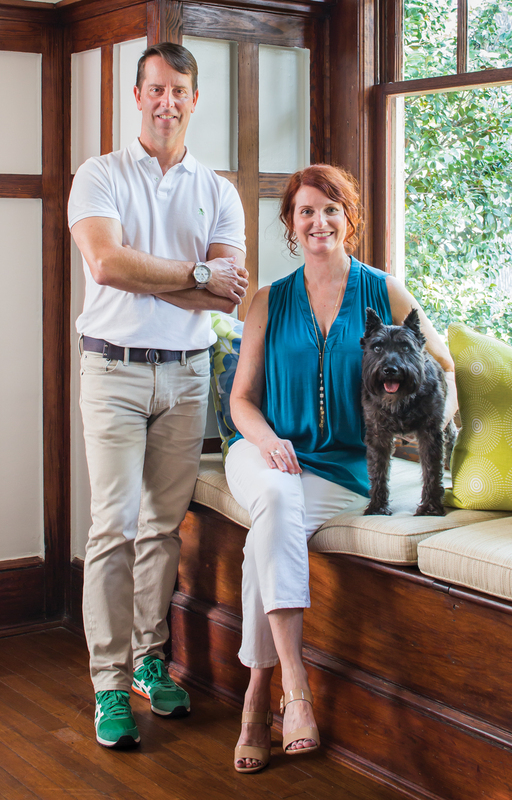 Interior designer Perry Walter and homeowner Stephanie Nase, a management consultant, here with miniature schnauzer Boris. 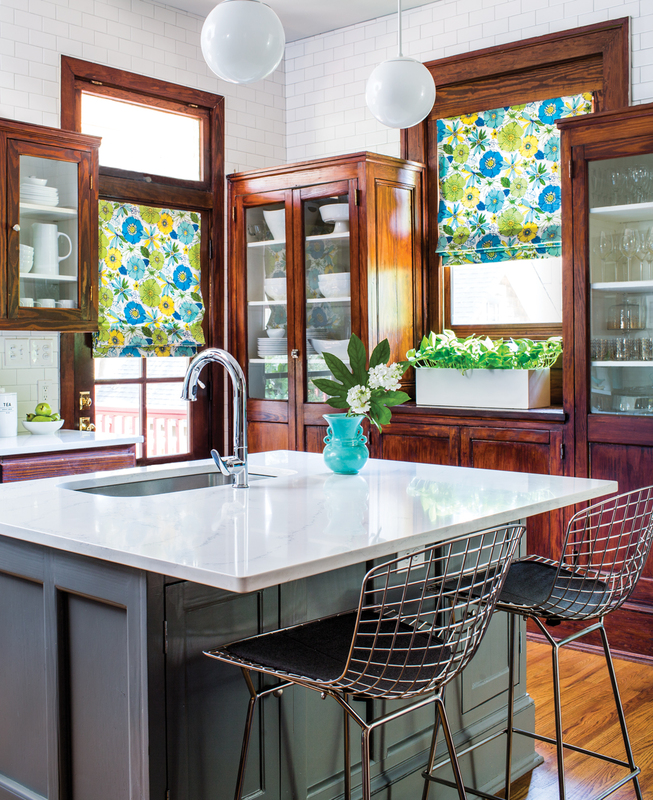 Rich wood cabinetry—some original, some added during a previous remodeling—benefits from light modern touches such as the white quartz countertop and ’50s-inspired fabric on the Roman shades. “I adore the original tall built-in cabinets,” says homeowner Stephanie Nase. 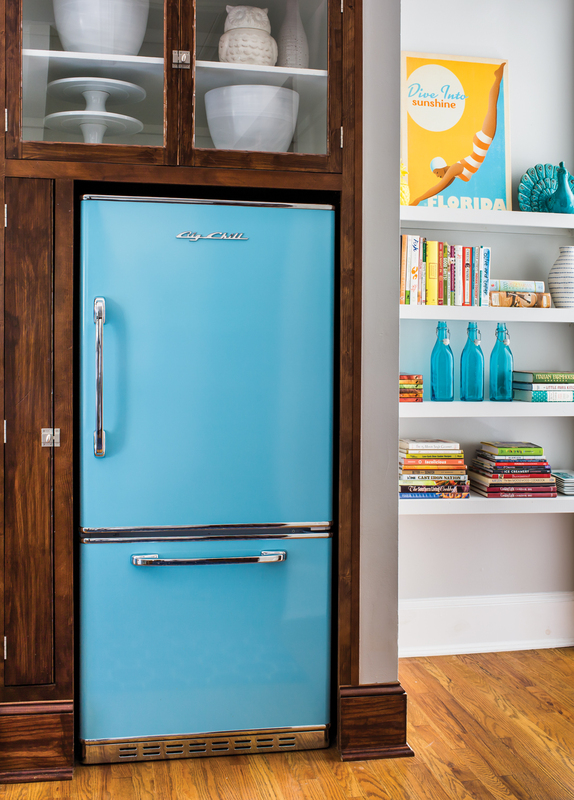 “The ‘Beach Blue’ Big Chill fridge is another wow piece that people comment on,” Stephanie says. Original woodwork and built-in glass cabinets epitomize Craftsman-style warmth. Interior designer Perry Walter replaced dark green tile around the living room fireplace with gray stacked-stone as a contrast to the wood tones. Vintage armchairs are recovered in Kravet fabrics that evoke an older era. The coffee table is a reproduction of the iconic Noguchi design. 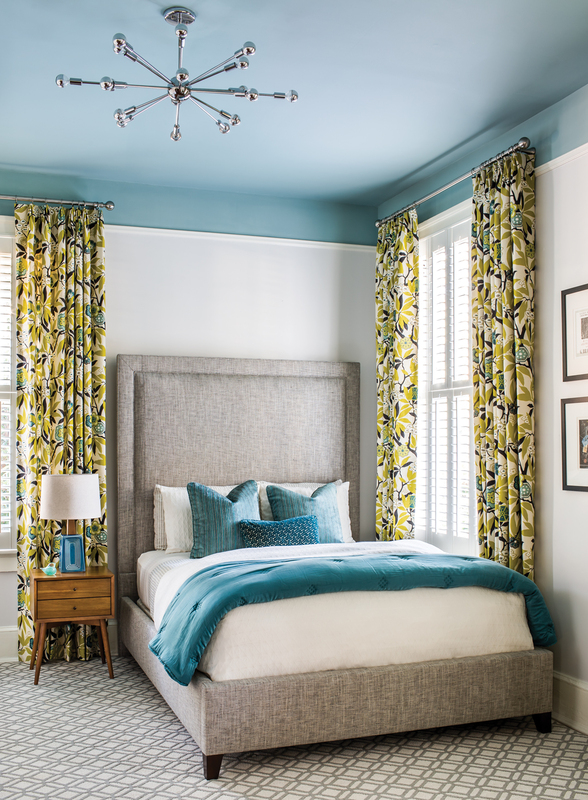 A blue ceiling and teal accent colors distinguish this guest bedroom. A ’60s-inspired light fixture and vintage-looking fabrics in the master bedroom continue the nod to midcentury style, but the designer didn’t want the look to be all from one era. 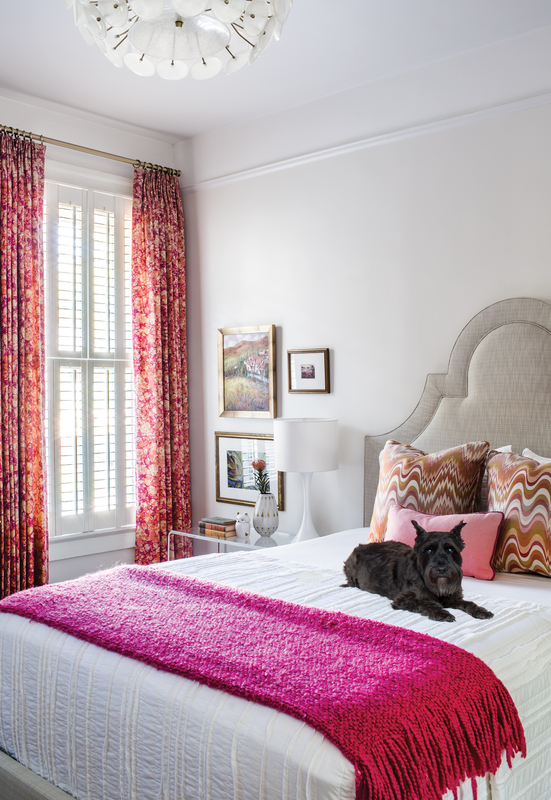 “The acrylic side tables in this bedroom modernize the look and add a touch of glam,” Perry says. With Perry on board, the pair first lightened and united the overall house inside by painting walls shades of pale gray and white. The designer also worked with contractor Adam Wood of Ashwood Homes to freshen up the kitchen and baths, adding new countertops and tile. Then came the fun part: figuring out furniture placement and adding colorful fabrics and window treatments with a modern bent. 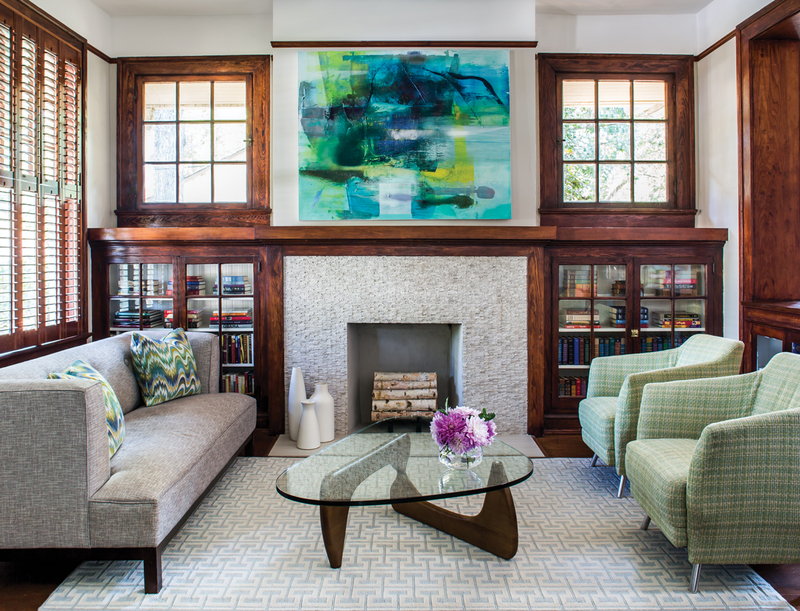 “Fortunately, Stephanie isn’t afraid of pattern or color and wanted to put a little pink and glam into her home along with the turquoise and greens,” Perry recalls. He played off midcentury furniture she already owned, reupholstering some and acquiring new, complementary pieces. Perry also layered in modern furnishings from other eras to keep the look well-balanced and lighthearted. Patterned contemporary wall coverings and pillows brought in the spirit of the ’50s and ’60s; a retro-looking wallpaper by Cole & Son covers the dining room ceiling, providing the kind of wow factor Stephanie wanted. 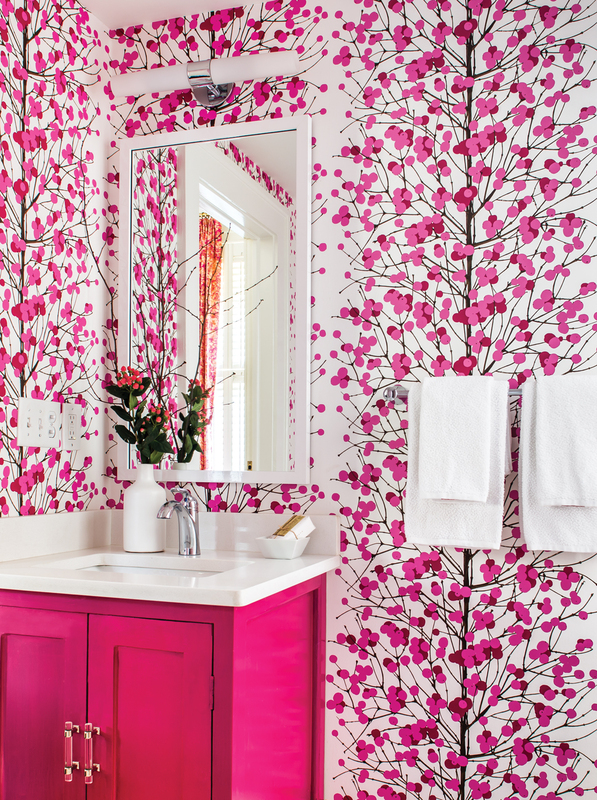 “We found the pink and white Marimekko wallpaper, and then we decided to paint the bath vanity fuchsia to match,” Perry says. 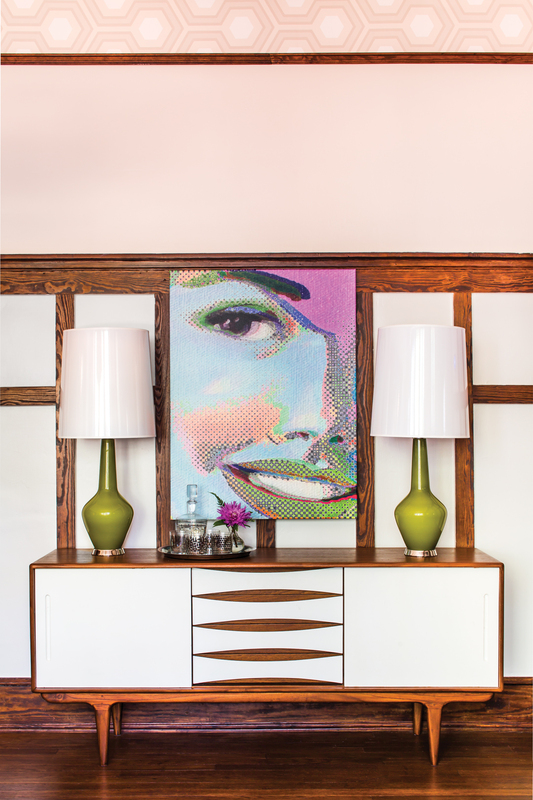 “The sideboard in the dining room is a midcentury-modern reproduction,” Stephanie says. 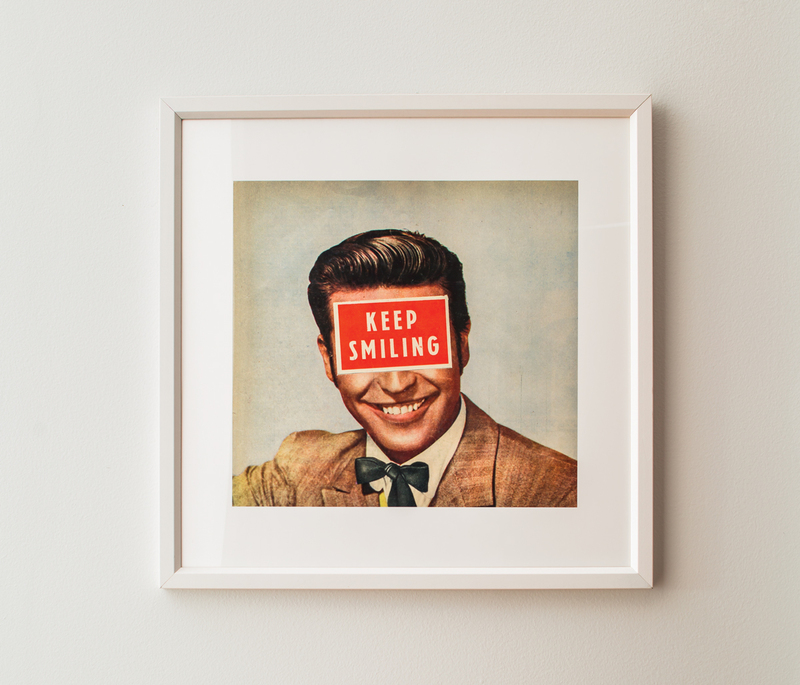 “I love the sleek Scandinavian design.” Once she purchased the vibrant pop-art print, it inspired the pair to use pops of pink elsewhere in the house—including in paint above the paneling and in the classic Cole & Son Hicks Hexagon wallpaper on the ceiling. 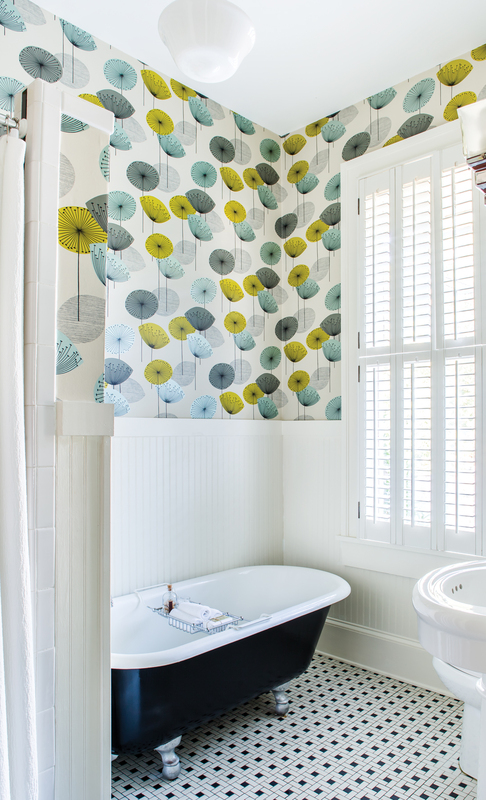 The whimsical Sanderson wallpaper is from the brand’s vintage collection. Stephanie reports that a previous owner saw this claw-foot tub discarded in a neighbor’s yard and purchased it.